C. Vinod Hayagriv, Managing Director, C. Krishniah Chetty & Sons avers, “The heritage jewellery forum was formed by the founder and has been one of our core collections for more than 70 years. We are just taking the whole concept of heritage jewellery to the next level by our unique initiative ‘Own History, Acquire Eternity’.” Under this initiative, the jewellery house is trying to create a consortium of high net worth individuals in India to bring back the prized possession back to its roots and retain its rich heritage. Gaja Heritage offers Raj Bari, which includes Bengali jewellery designs from Zamindari days. The jewellery has been inspired by the forts and palaces of Bengal. The Lodhi style of heritage jewellery is conceptualised based on the styles of Maharajas and Maharanis from Mughal- and Rajput-era. “We want to attract all sorts of customers by being their wedding/major event jewellery consultant, by providing best of services, designs and product collection at affordable prices,” says Sharad Mohata, Director, Shree Ganesh Jewellery House Ltd. The price range, for the Heritage Collection, as shared by Hayagriv starts from Rs 1 lakh plus. On the same lines, Jain shares the range to be from Rs 1 lakh and goes upto 5 lakh. The marketing strategies range from newspapers ads to SMSes. Heritage jewellery is timeless and will always be in trend; it goes well with a majority of attires and creates a style statement irrespective of the occasion and outfit. “If for instance, we take up the traditional suits, out of 10 suits, 9 would be having gold work on it which ultimately goes very well with the heritage gold jewellery,” says Jain. 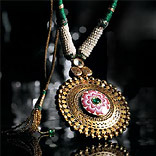 Earlier, one piece of such jewellery use to take three months for production, now the same is designed in a lesser time. Heritage jewellery is close to every woman’s heart, given its rich ethnic connection with royalty and golden era of kings and queens. Nowadays, heritage jewellery is so designed as it is light in weight vis-à-vis the olden days. The demand and the ever-rising gold prices have somewhat contributed to this fact. Mohata comments, “We are very happy and proud to bring to our customers the world class experience of shopping heritage jewellery from our rich and exclusive collection. We specialise in filigree and polki work and wish to establish ourselves in this high end market. Gaja Heritage, sprawling over an area of 2600 sq ft, is our first store for classic heritage jewellery in Kolkata being one-of-its-kinds under an organised brand.” Apart from Kolkata, Shree Ganesh Jewellery House has its presence in Mumbai, Hyderabad, Delhi, Bangalore, Chennai and Ahmedabad. The company intends to launch 40 plus stores in various formats across India in the next two to three years. The jewellery industry in India has 3.5 lakh players and is estimated to be worth about Rs 40,000 crore. The opportunities which lay herein are numerous and it’s just a matter of time when heritage jewellery will rule this lucrative market. A combination of pearls, emeralds, rubies and diamonds make the ornament an exclusive piece that adorns an antique look wedded to Indian culture and heritage, which moves down the dynasties/ descendents and worn with élan!